I fought long and hard to resist writing this, and then capitulated. 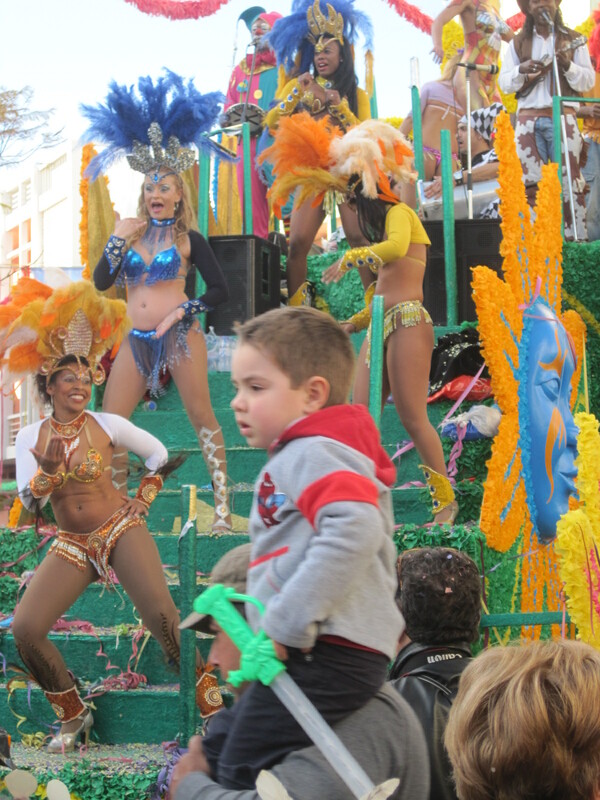 A bit like my husband when the dancing girls stopped in front of us and took each of us by the hand, to my expression of delight and his of abject dismay. 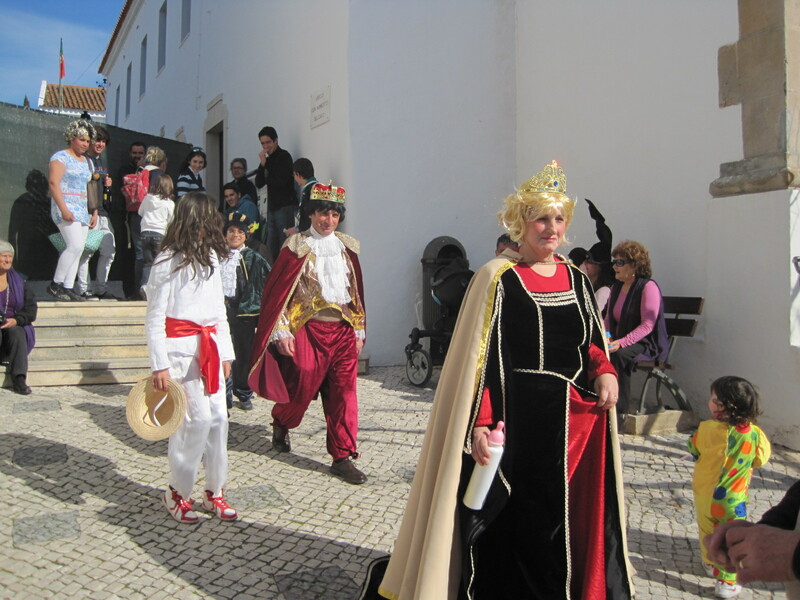 Happily for him, it was over in a flash and we were back in the crowd, minus my jester’s hat. Shame! 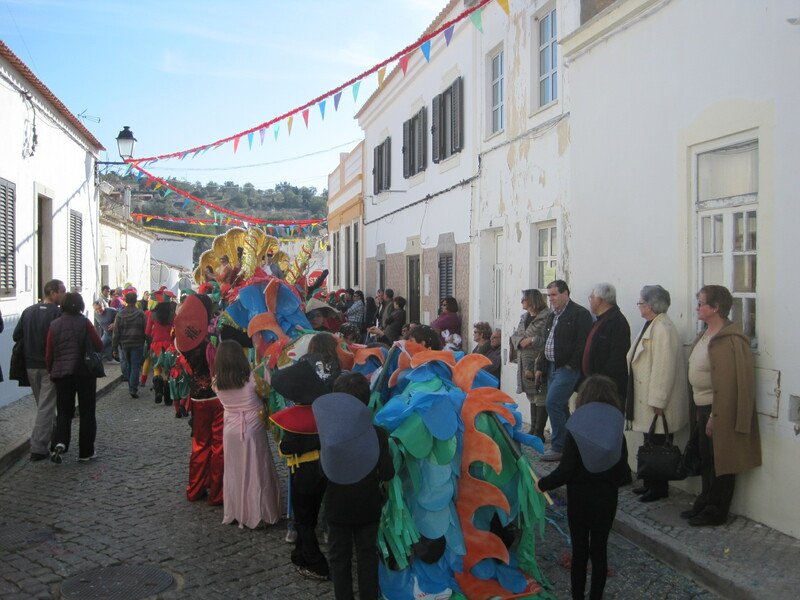 It was our first experience of the Loule Carnaval procession and it fully lived up to our expectations. 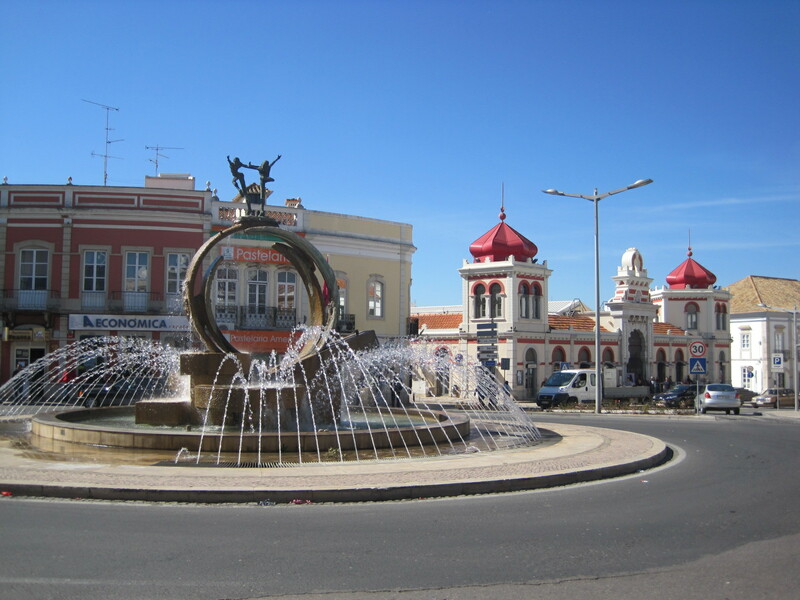 Loule is an interesting market town, 16km north of Faro in the Algarve. 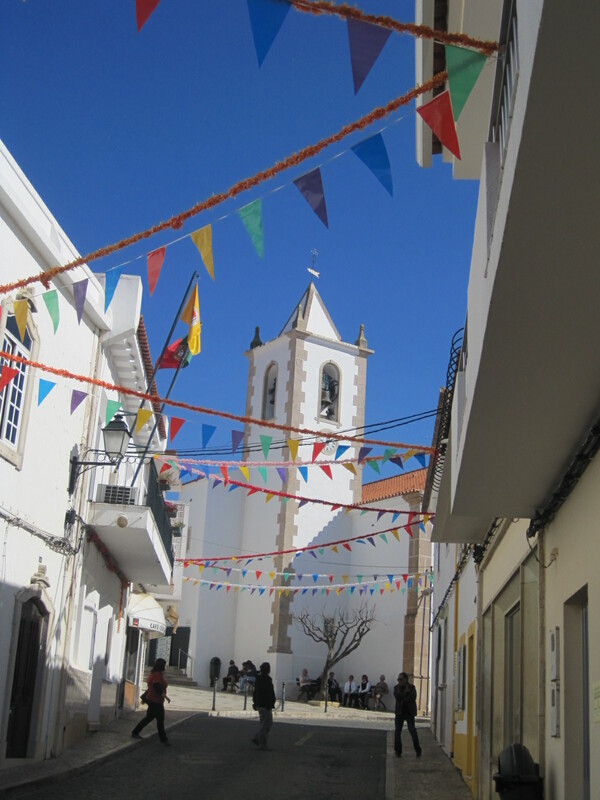 The remains of the castle date back to the 12th century and the almedina, the old quarter, is a maze of streets lined with artisan shops and cafes. The Arab style market hall on Praca da Republica is a focal point, and there’s a lively street market on Saturday mornings. 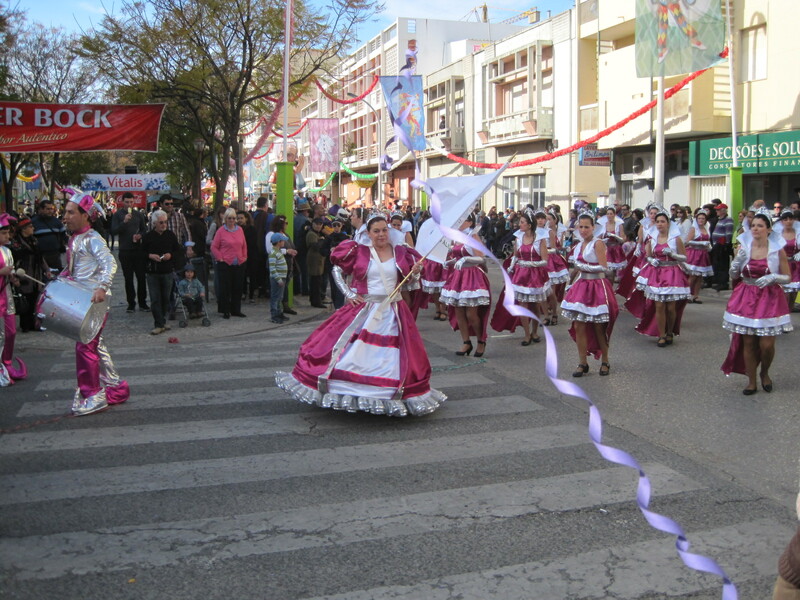 Much of Loule is a modern sprawl and we were uncertain about access to this, the Algarve’s biggest Carnaval celebration. For once, it turned out well. 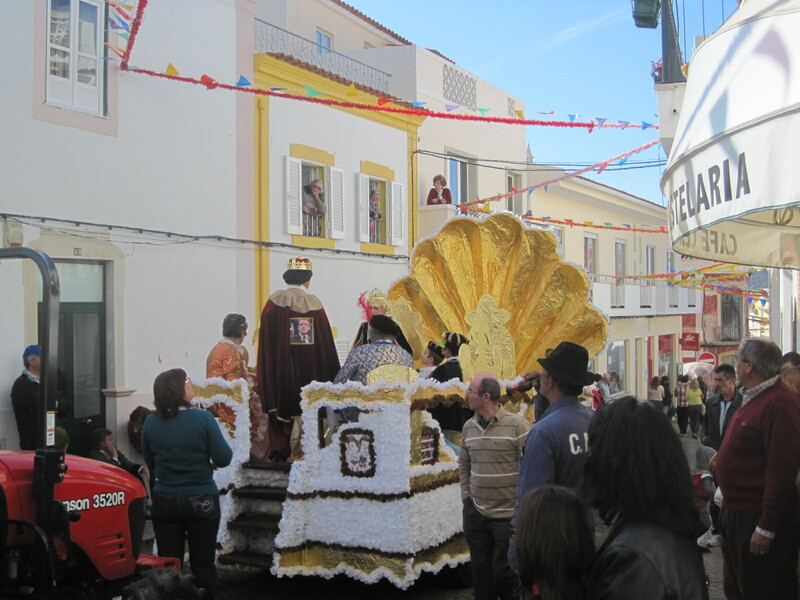 We approached the town on the N270 from Sao Bras de Alportel and at lunchtime traffic was minimal. There was the distinct impression that the townsfolk were conserving their energy to party later. 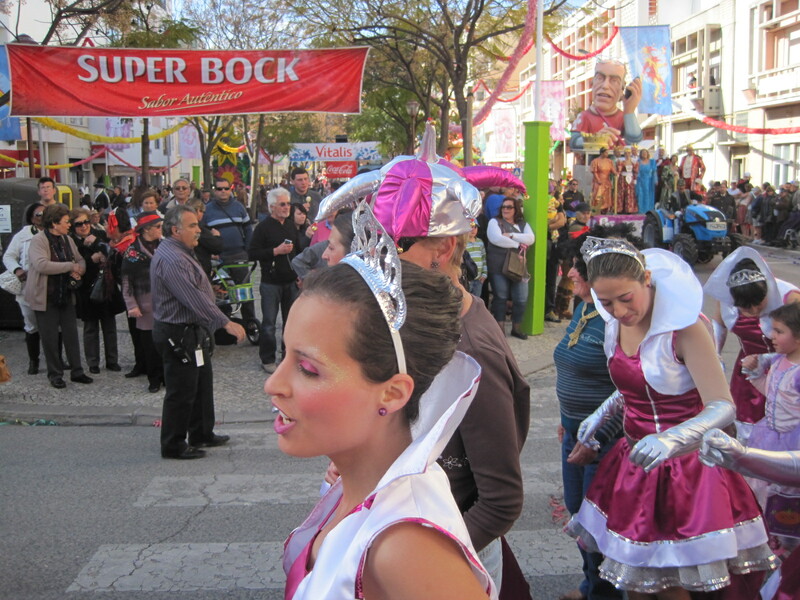 Establishing where the barriers were on the main street, Avenida Jose da Costa Mealha, we parked a little way out on Rua Alfonso de Albuquerque and strolled back into town in pleasant sunshine. A pavement coffee and pastry to watch the excitement build was a good choice. 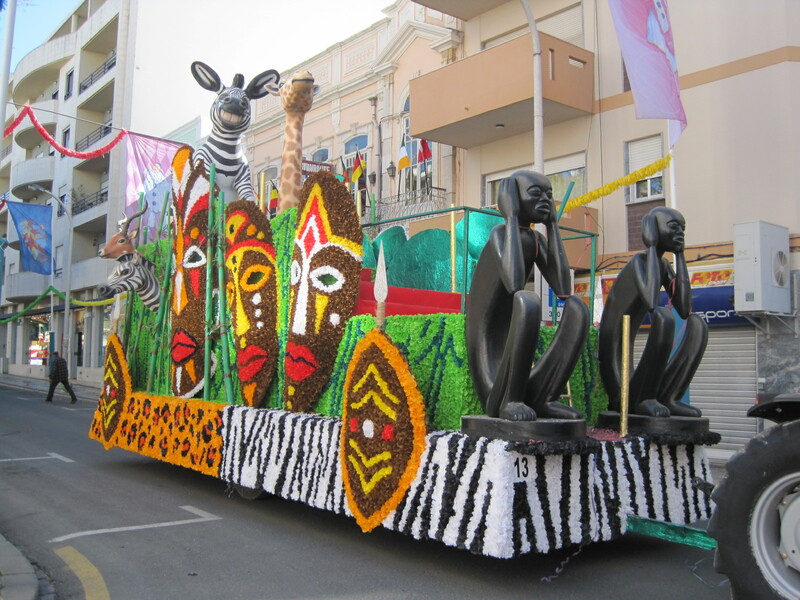 The 15 floats were towed gently into place and there was plenty of time to wander between them to admire and take photographs without the crowd. Loudspeakers announced a 3pm start and it was time to seek out that good spot, having first paid your 2 euros at the kiosk. 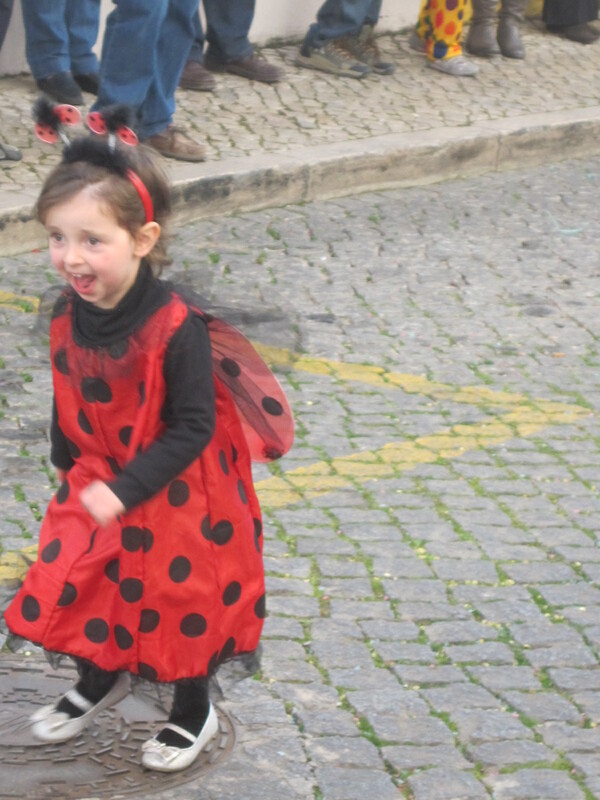 It was entertainment in its highest form just watching the locals arriving, many of the children in costume and jiggling with excitement. 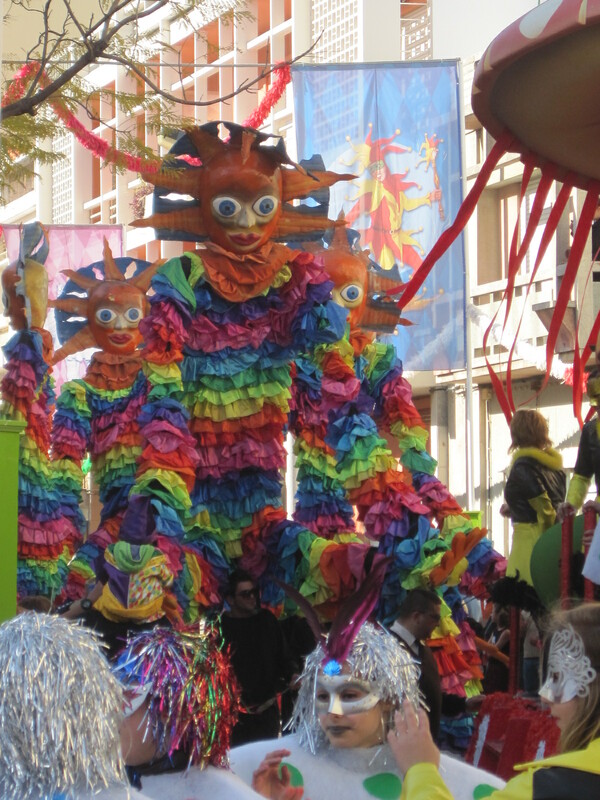 This year costume shops and stalls had been set up to encourage people to get into the spirit of Carnaval and shake off the doom and gloom. 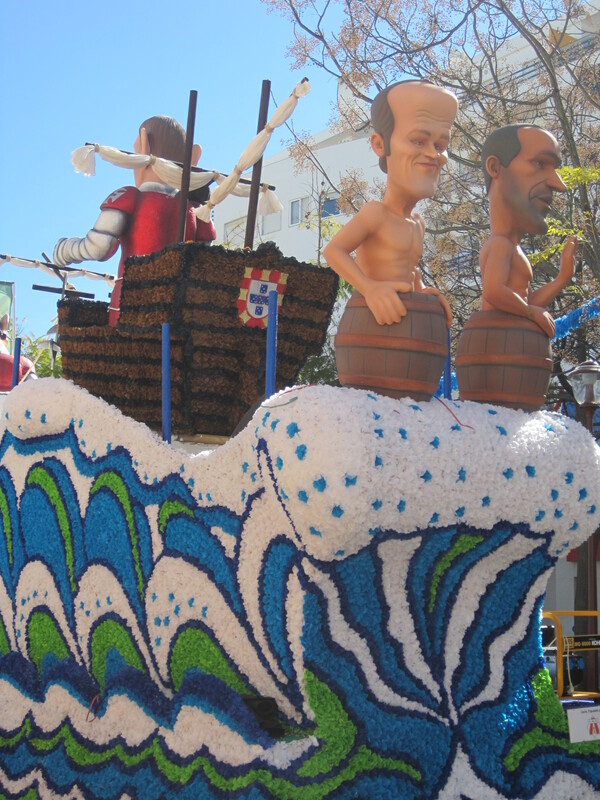 The Portuguese are very happy to poke fun at their leaders and celebrities and the Carnaval has a political theme. 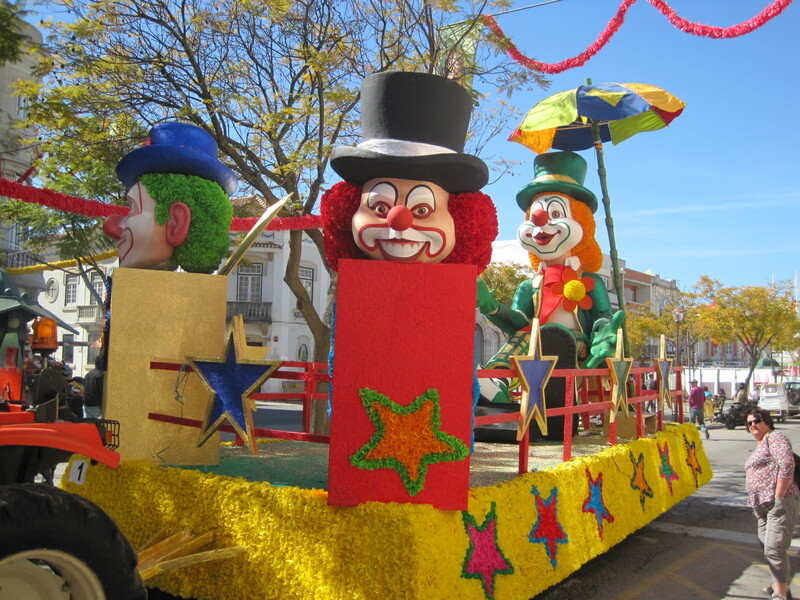 Many of the floats produced wry smiles if not outright chuckles. 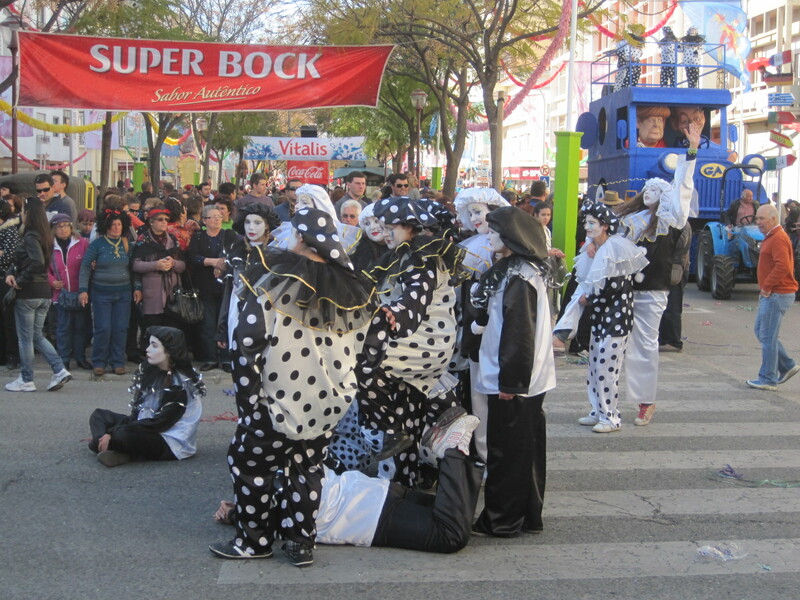 Just a bit more shuffling of feet and the parade was assembled and off. 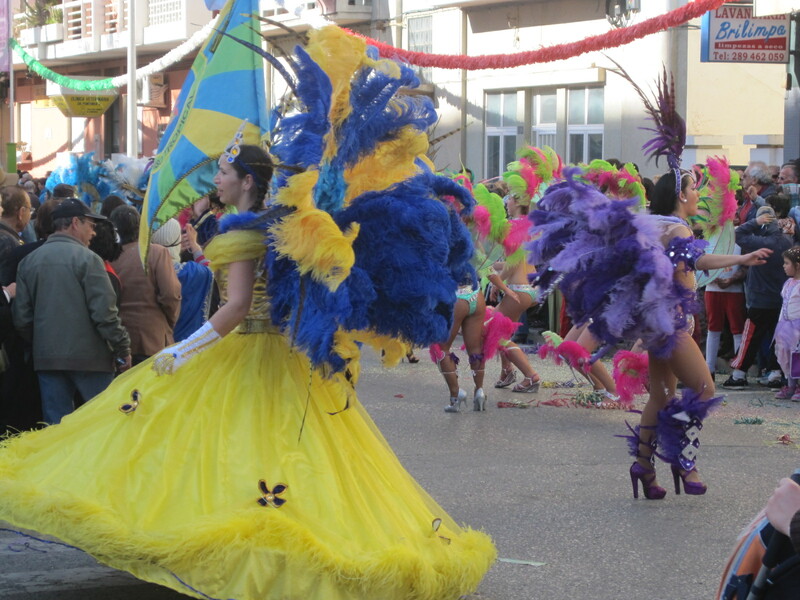 It was everything you could have hoped for and more- strange characters on stilts, who bent down to engage with the children, dancers by the score, trick cyclists, pierrots, and of course the “Samba” ladies in their provocative outfits. 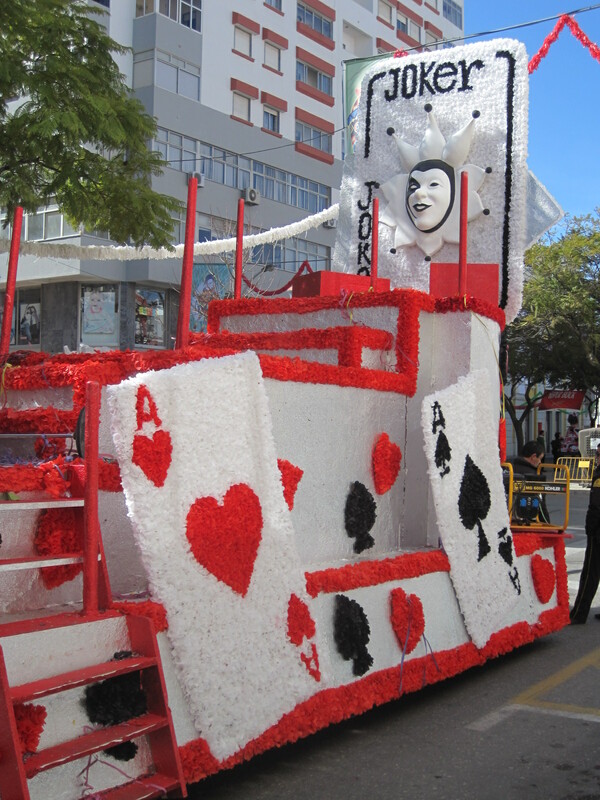 As each float pulled to a standstill hoards of paper streamers and tiny keepsakes were flung into the crowd. As the sun sank behind the buildings I had to jiggle harder to the music to keep warm. 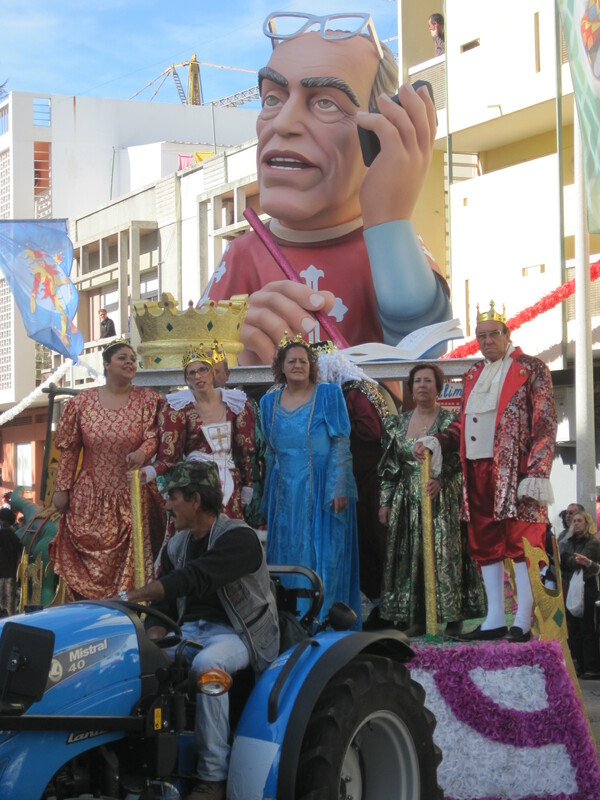 It took over an hour for all of the floats to pass by- 2 euros very well spent. 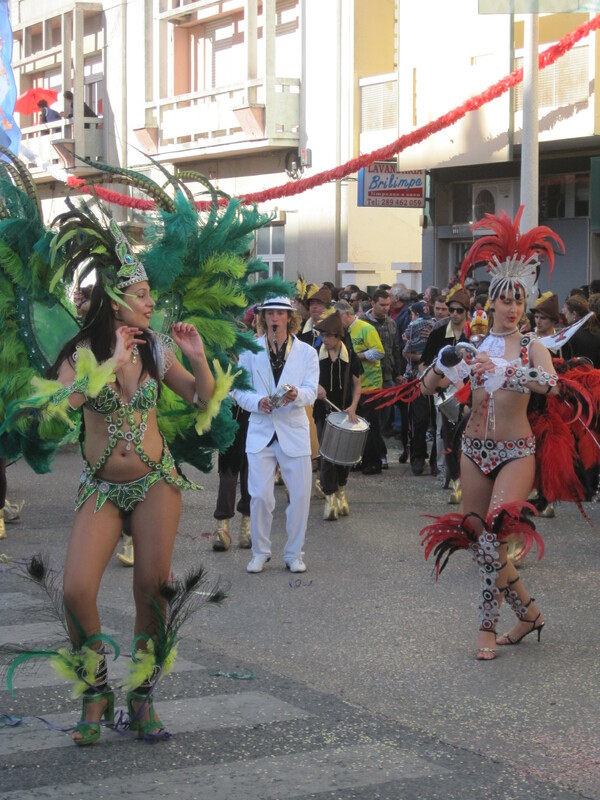 Our dancing ladies were just feet away when Michael decided that enough was enough- he wasn’t going to be involved in another round of embarrassment. My all too brief moment of fame, then I had to give the hat back! 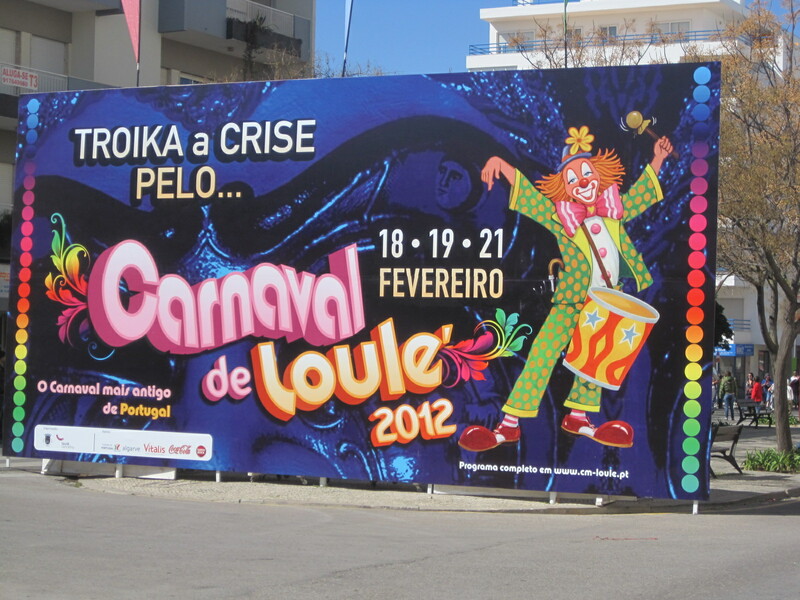 We really did have a great time, but it was in fact our second experience of Carnaval, Algarve-style. 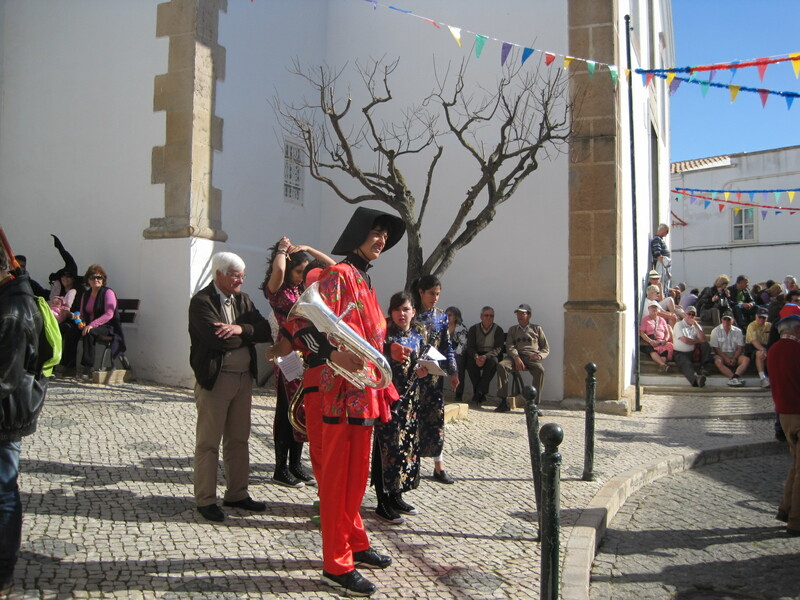 The event runs for three days, culminating on Shrove Tuesday, and on the previous Sunday we had gone to a far more low key and traditional style of parade at Paderne, a small inland village. We were familiar with the village having spent time there seeking out an exquisite art gallery, Corte Real, and on another occasion following a trail to Paderne Castle. Paderne regularly fools us and this time was no different. Apart from some streamers overhead there was little sign of life in the village so, assuming we’d got it wrong, we set off for a stroll in the sunshine, down to the Fonte, a rather intriguing spring. Half an hour later the village had mobilised into action and suddenly we were in the thick of the preparations. The excitement was tangible. Mystified we retired to a tiny café where a captivating toddler, dressed as a fluffy yellow chicken, was passed around its adoring family. 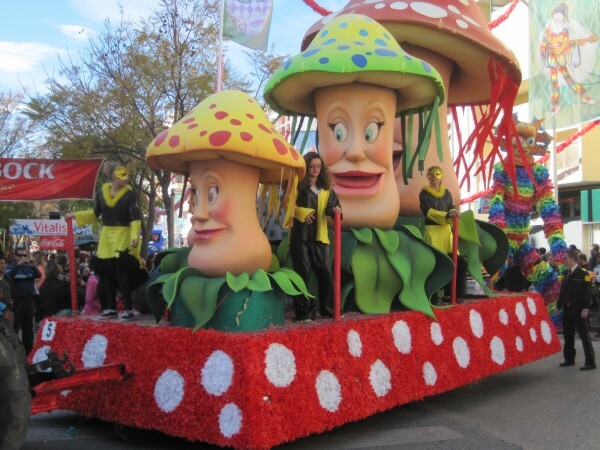 When we poked our noses back out again the parade was about to begin. 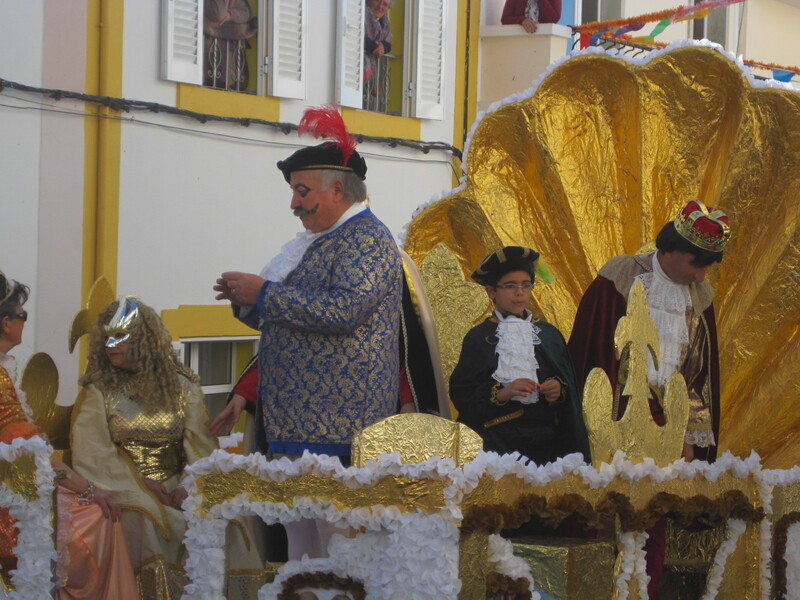 Although much smaller than its Loule counterpart, the procession was no less fun. 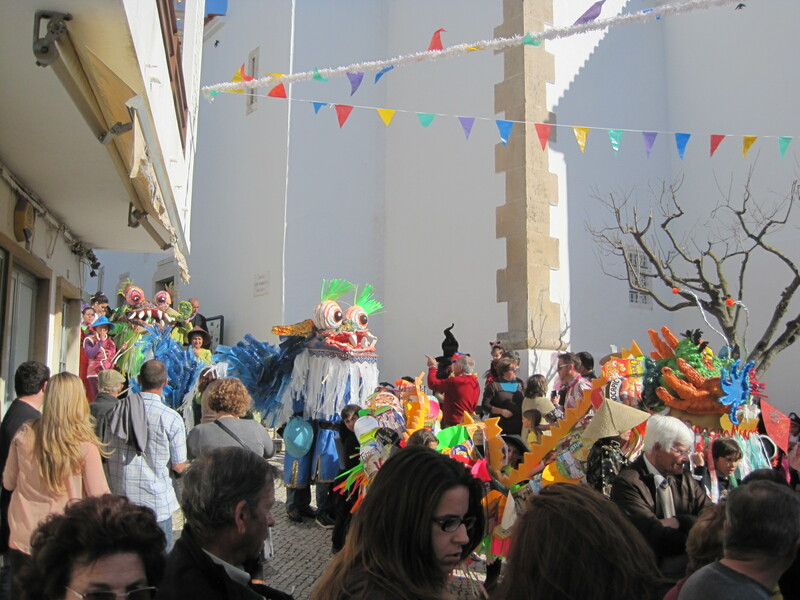 The setting was intimate, within just a few village streets, locals looking down from bedroom windows. 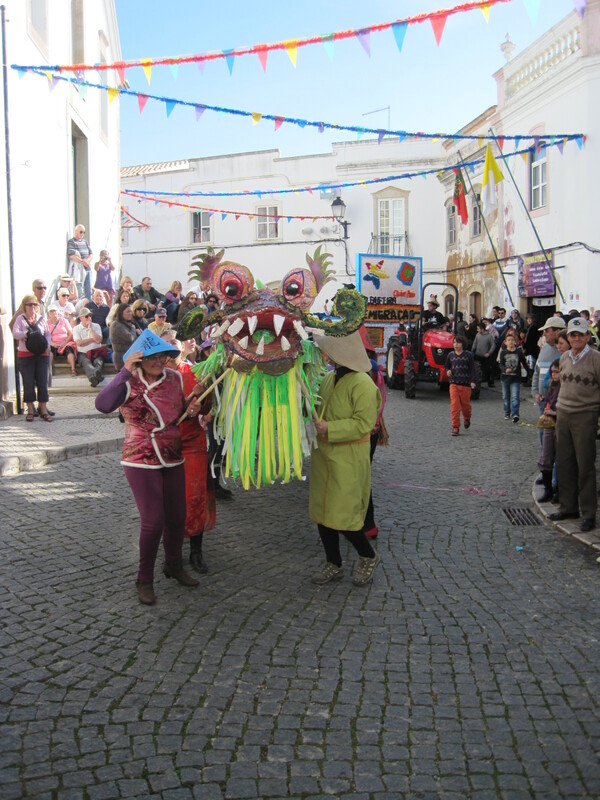 The lords and ladies mounted the floats and as they moved off four shimmering Chinese dragons manoeuvred into position. 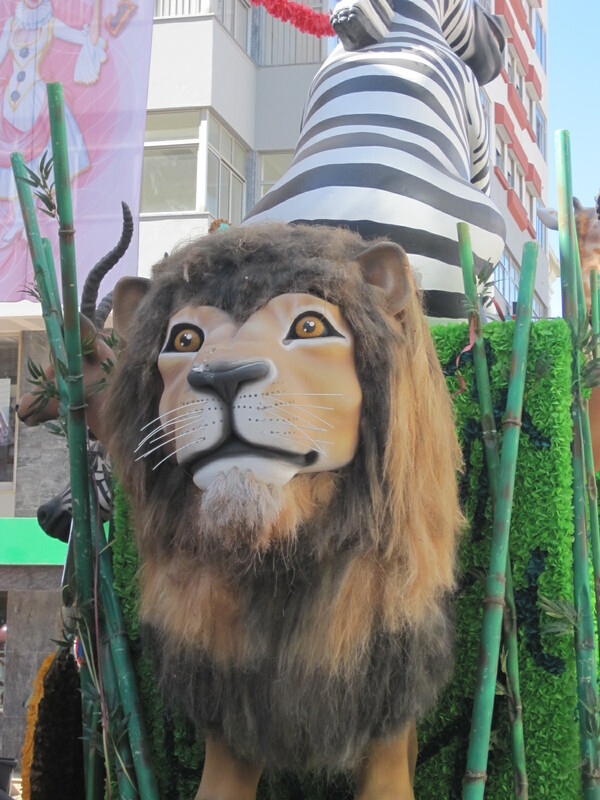 I was delighted to observe that their scales had been constructed painstakingly from cartons. 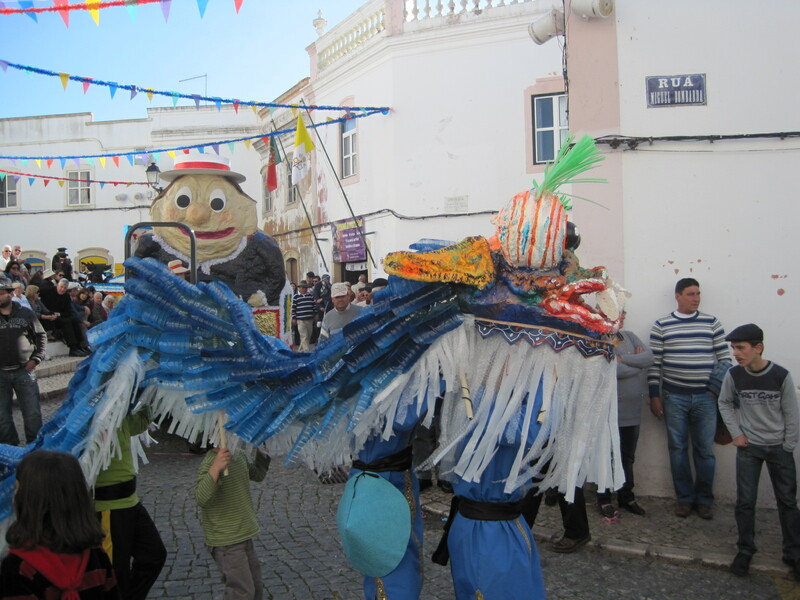 The theme was Chinese business and a flutter of parasols and coolie hats took to the streets. 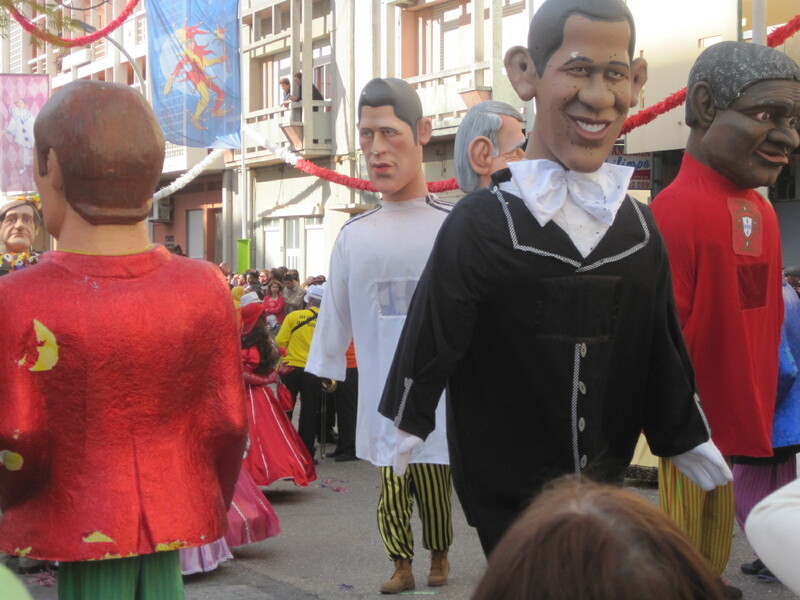 With enormous energy they paraded around and around, and as we made for home there were still queues at the kiosk. 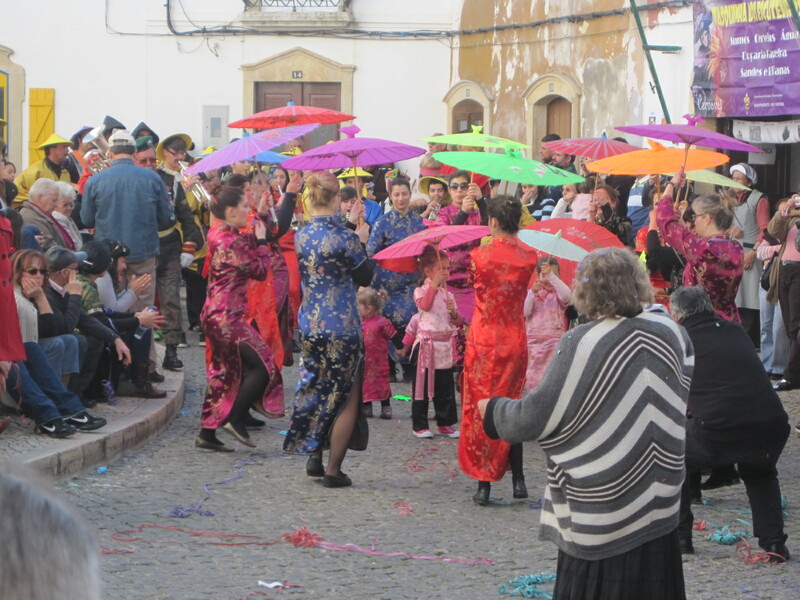 We were left in no doubt that the Algarveans know how to party. I’m entering this in the word a week photography challenge on celebrations as it just seems to fit so well. instant text messaging conversation (no voice and video yet, these demand a plug-in set up). On a completely different note Jo my apologies as I clearly thought you spent have of your time in the UK. So sorry. Ok Jo I am getting it now! Glad to know I hadn’t lost my marbles completely 🙂 London here we come! 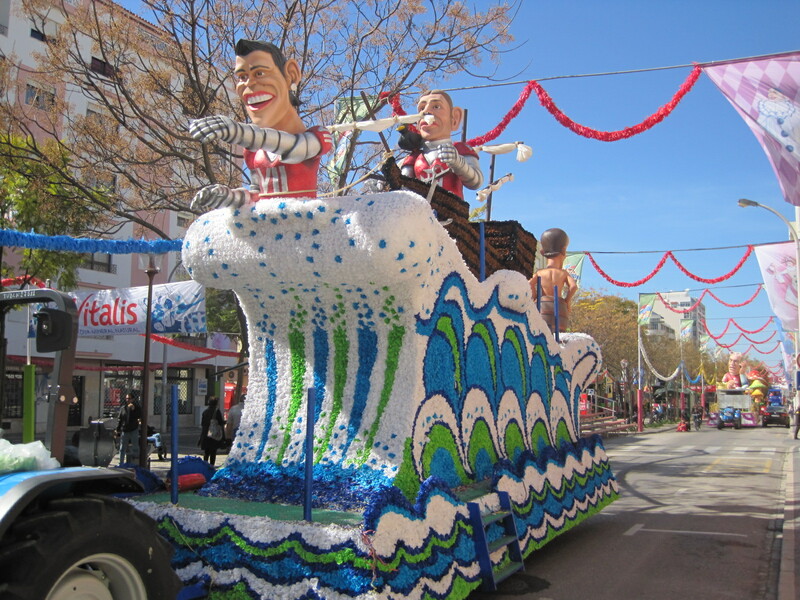 Those floats look amazing! 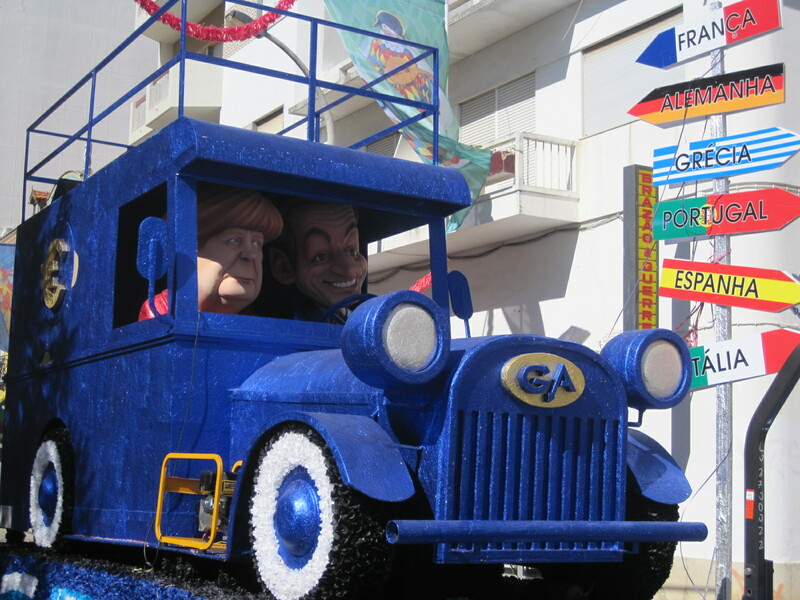 What are they built from? 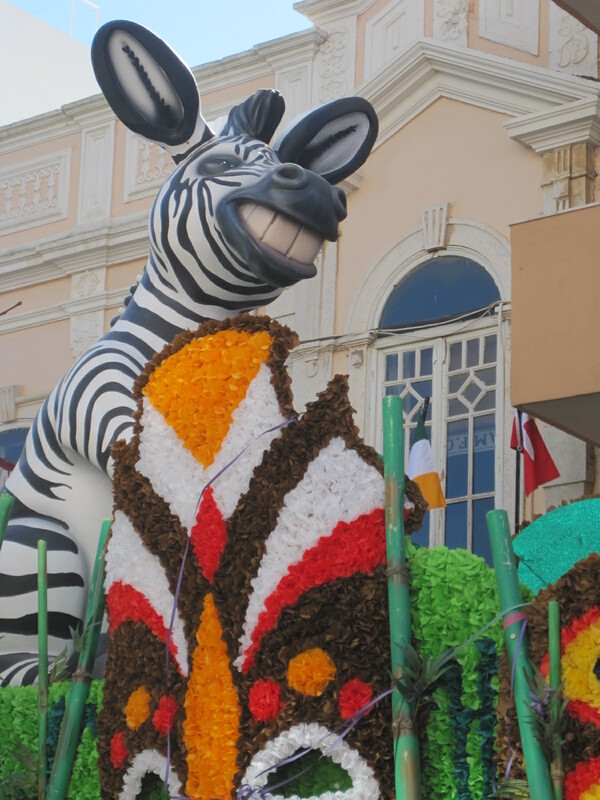 I’d like to see the flower festival in Jersey one day, though not this year! 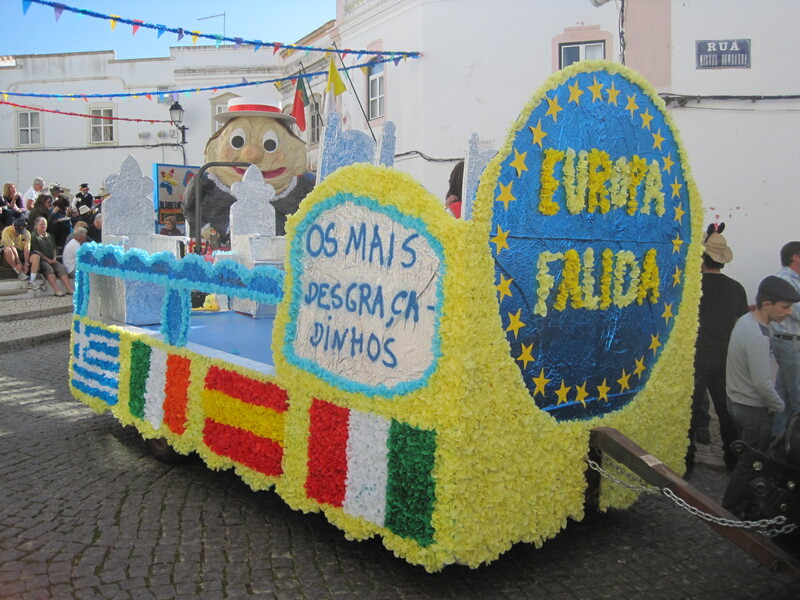 Europe seems to do much better festivals than we have, though I remember village fetes with floats with fondness from my childhood. I’d love to be there, it must be crowded. I like how they poke fun at their leaders and celebrities 🙂 We are having Fiesta in town in about 3 weeks. 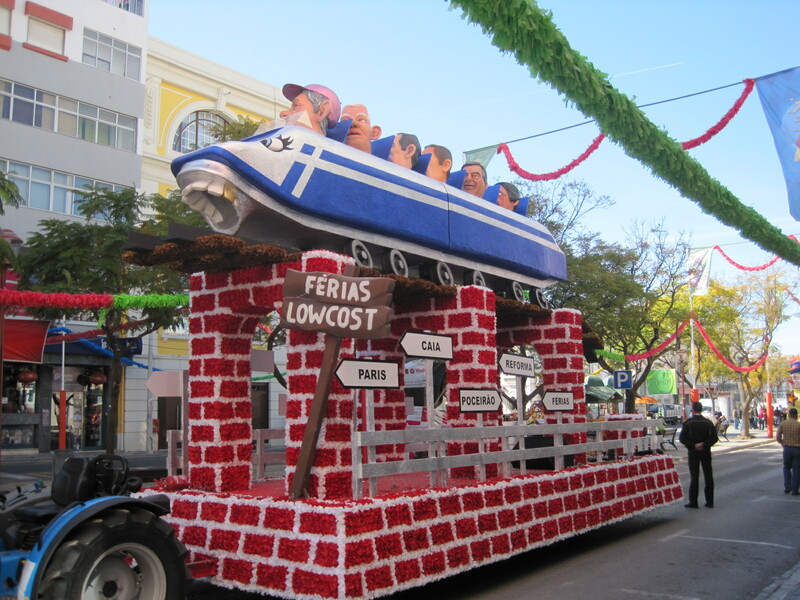 You have to flight to get a spot to watch the parade…. Maybe, I will make it next year. Thank you 🙂 I try to hang on to the smile.